Have you thought about applying for scholarships to pay for college? Are you a college student or a parent who has a child going to college in the next few years (or is already in college)? Then you’re going to find a lot of value in this interview! If you read my article on paying for college when you have no money than you know that one of my tips was to try and get as many scholarships as you can. But how? How many scholarships can you get? Is there a cap on scholarships? Do you qualify? These are all great questions you may be asking yourself. I applied for a number of scholarships in high school and I actually won a good amount but I still wish I had applied for many more. Especially after hearing about how my guest Jocelyn Paonita was able to get over $125,00 in scholarships to cover her tuition! After hearing about Jocelyn’s story, I knew I had to interview her. Jocelyn was able to secure enough money to cover her tuition including 6 months living abroad (in Spain) and had a little left over for other expenses! Now Jocelyn is not only a great example of someone who was able to pay for college with scholarships but she is also passionate about helping others do the same. She took her experience and created The Scholarship System which helps families all around the country pay for college with as little student loan debt as possible by teaching them how to secure scholarships and supporting them along the way. I absolutely love how she used her experience to help others! OK, now it’s time to pick Jocelyn’s brain on scholarships. I gathered some common questions I hear people ask and she was kind enough to answer them and share her tips. Q. Can anyone really get scholarships? Do you have to be an athlete or a straight A student? A. If they are willing to do the work, nearly any student can get some sort of scholarship. This is one of the biggest misconceptions when it comes to scholarships. My SAT score was well below average and believe me when I say I was the FURTHEST thing from an athlete. My family hides when I pick up a ball! Still, I was able to graduate completely debt-free because of scholarships. The trick is knowing which ones to go for. Q. Where do I find scholarships? A. When it comes to finding scholarships, you want to try to find the ones that have less competition. They take some extra digging but the extra time spent up-front will be more than worth it because students compete against fewer people for the money. For example, it’s quick and easy to find the Coca-cola or Dr. Pepper scholarships but they also receive tens of thousands of applications. Instead, try asking your local guidance office or the financial aid office first. Then, look around at local businesses to see if they sponsor scholarships. Many times, local community foundations are a great place to look as well. Once you look local, then you can start looking on online search engines. Two great sites to start your search are Brokescholar and Big Future. 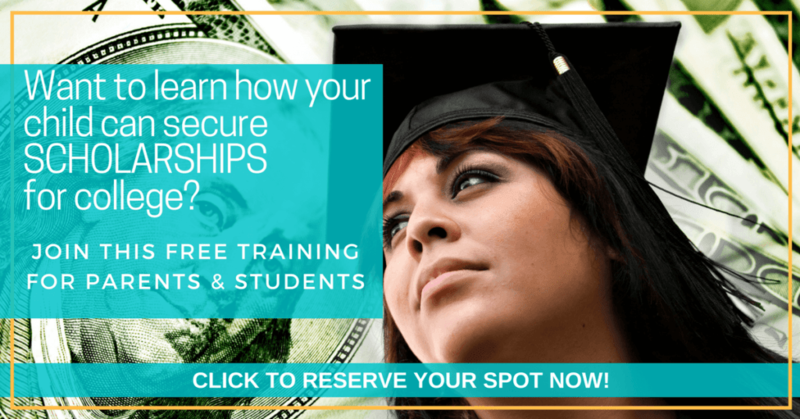 We cover this extensively in our Free Webinar 6 Steps To Quickly Secure Scholarships For College. Q. How do I know if a scholarship is real and not a scam? A. This can be tricky. I got sucked into scams before I knew what I was doing! The easiest way to know if a scholarship is a scam is to ask whether or not they are basing the selection on luck or an applicant’s competitiveness. For example, does it take 10-15 minutes to apply? Does it say “easy scholarship” or “no essay scholarship”? If so, these are typically NOT worth your time! Instead, if they ask for transcripts, recommendation letters, essays and other materials, that is a good indication that the scholarship is legitimate. Q. What is the most money I can get from a scholarship? Is there a maximum number of scholarships I can apply for? A. Some universities will cap students at the total cost of attendance before they reduce other aid you receive from them. For example, if a student receives a grant or loans from the university, they will be capped at the total cost of attendance. If your child hasn’t received anything from the school, technically there wouldn’t be a cap. They may have to claim excess earnings on taxes though. Q. Is it possible to get enough to cover my tuition? A. Absolutely! And you don’t have to get enough to cover tuition in one big award. Students can apply for smaller scholarships that add up to cover all of the tuition. That’s exactly what I did. Q. How soon should I start applying for scholarships? A. Ideally, students should begin no later than junior year. Still, students can apply all the way through their senior year in college so if they are beyond their junior or senior year in high school, it still isn’t too late to start. Q. Can I get scholarships while in college? A. Not only can students apply if they are already in college, but they should! As a college student, they are actually more competitive because they are showing committees that they are actually going to school and doing well there. This makes it an easier decision for scholarship committees when they want to choose someone who they know will graduate. Q. Can scholarship money only be used for tuition or can it be used for other college expenses? A. Scholarship money can be used for all sorts of expenses including tuition, room and board, books, fees and more. Some scholarships will dictate what the money can be used for but, many times, they will just send it to the university and have it applied to the bill. If a student gets enough scholarship money to where they have more than their bill, they will actually receive an overage check. Q. Any other tips or tricks for applying for scholarships that you would like to share? A. Applying for scholarships can seem overwhelming. The way to survive the process is to take it one step at a time. Don’t look at it as a major undertaking but instead create your own process and materials. 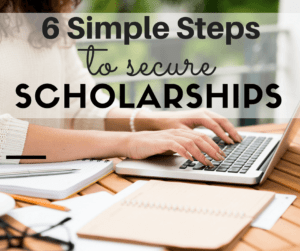 That is the beauty of The Scholarship System – we break down the massive process into a 6-step system to follow. It’s a roadmap to scholarships. The Scholarship System has saved families over $720,000 through our online course and we have yet to tally up the most recent semester. I plan on surpassing $1million in savings this year and hope to see this number continue to grow! This is such valuable information! I want to thank Jocelyn for answering all my questions and taking some of the guesswork out of scholarships! 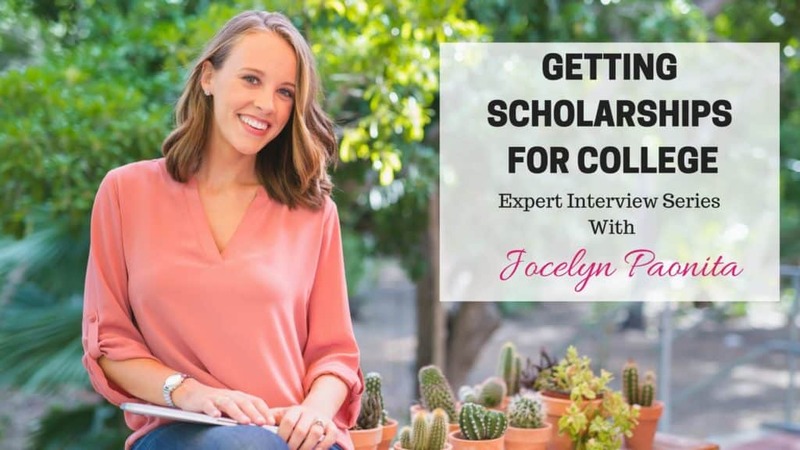 Since we couldn’t go into ALL the details in this article I want to make sure you go over and check out Jocelyn’s FREE WEBINAR: 6 Steps To Quickly Secure Scholarships For College. What are some of the best money apps for kids? How about the best allowance and chore apps for both kids and parents? I am a big fan of apps in general (coupon apps, educational apps, easy pay apps) and think that apps are a great way to simplify activities and to educate as well. Not only do we always have our phones on us but most of our kids are on some sort of device that has apps on it, so why not make those apps educational and fun? 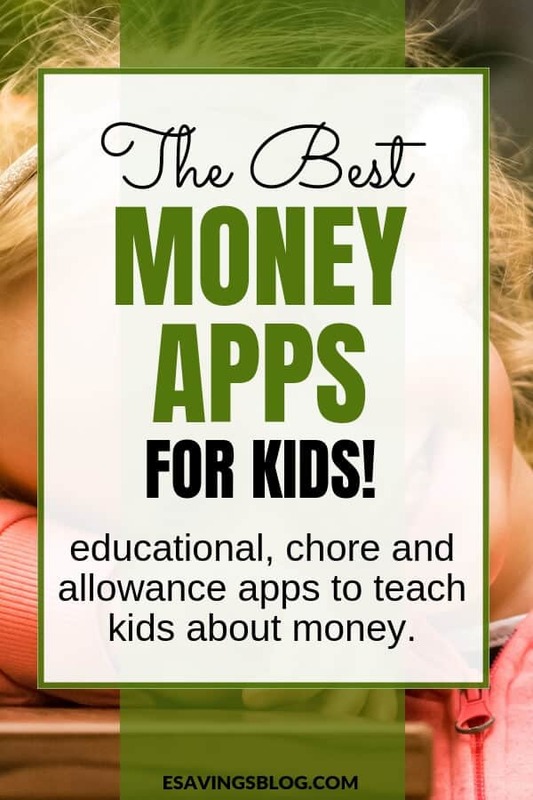 Whether you’re looking for an app to help you as a parent, to easily keep track and assign chores to your kids, one to help you pay allowances to your kids or one that allows your child to learn responsibility and money, this list will have something for you. Pretty much all of these money apps are available on iTunes and most are also on Google Play and in the Amazon App Store. 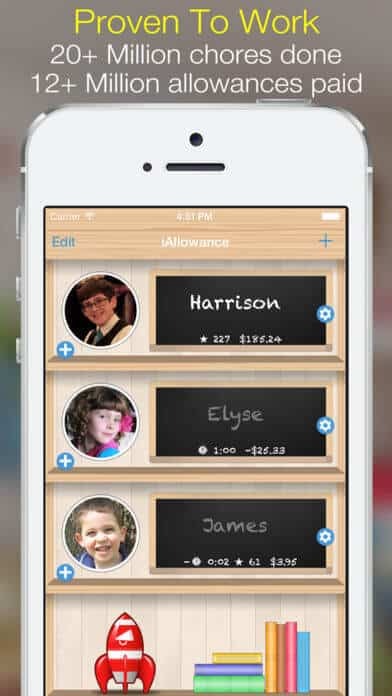 iAllowance is a great app that helps you manage all your children’s chores, allowances, and rewards. Put piggy banks and paper money behind you! iAllowance is a great app to manage your child’s finances and teach him or her about saving and spending money. Whether you want to set up a weekly allowance or pay out a special reward, iAllowance handles everything for you with an eye-pleasing and easy-to-use interface. PiggyBot is a parent-designed, kid-tested allowance app that helps kids spend, share, and save smartly. PiggyBot is a fun, easy way to track allowance spending and saving. The only parent-designed, kid-tested allowance app that helps kids spend, share, and save smart. PiggyBot is a fun, easy way to track allowance spending and saving. No missed allowance, no forgetting IOUs, just money smarts turned fun! Instead of cash, your kids have a virtual balance with you. Think of it as an IOU. Each child will have separate Spend-It, Share-It, and Save-It accounts. You decide how to allocate their allowance. Kids can set goals, take pictures of things they want, share money, and more. 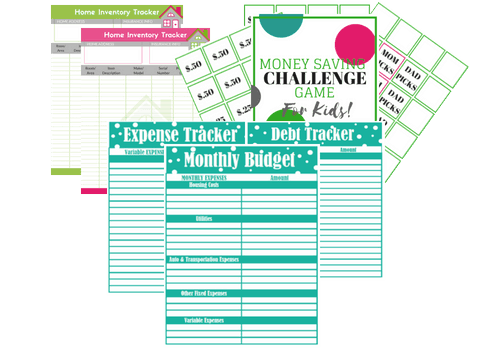 When they save enough, they are a “Goal Getter!” And there’s a fun screen to show off the items they purchased, reinforcing principles of saving for wants, needs, and nice-to-haves. It’s a virtual piggy bank that pays off in real life! 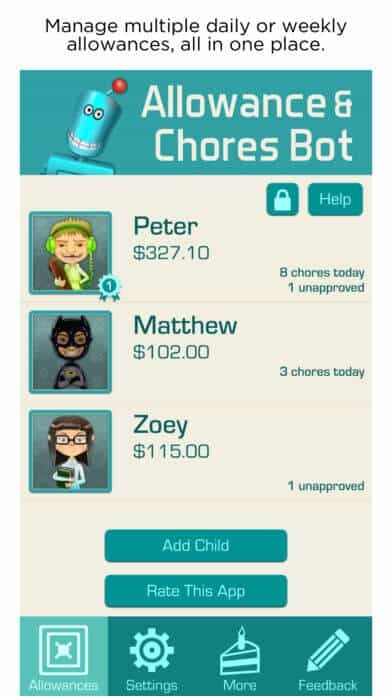 Allowance & Chores Bot is another great chore and Allowance app that can help manage all your children’s chores. With Allowance & Chores Bot you can create a daily, weekly, or monthly allowance for each child. Each child can have their own rate of periodic allowance, or you can give them allowance payments based on the completion of chores, or a mixture of both. Each chore can be a one time chore or repeated on a daily, weekly, or monthly schedule. Each chore can be configured so completion is required for the child’s periodic allowance, or the chore can be configured as an extra reward in addition to their allowance. Want the kids begging to do chores? With ChoreMonster, it’s possible. No chore charts required. 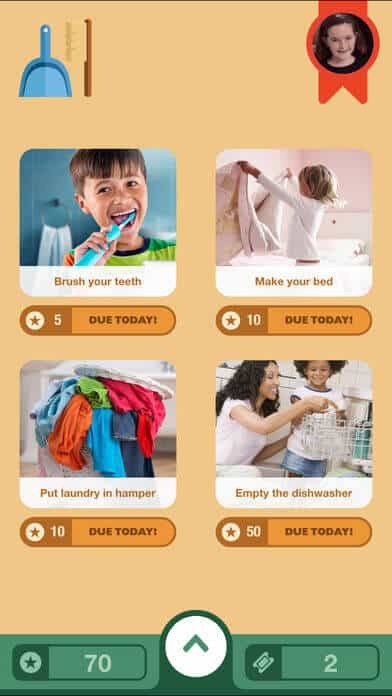 ChoreMonster is a suite of web and mobile apps that make chores fun for kids. Take the tension out of chores with an easy-to-use tool for your 4-12-year-olds. Kids earn points by completing chores and earn rewards to be used towards things like ice cream, an hour of Xbox, or a family camping trip. Parents manage their children’s chores and the rewards they can earn. Chore Monster is available on iTunes, Google Play, and Amazon. Bankaroo is a virtual bank for kids. It teaches kids (and parents) about the value of money in a simple and fun way. Bankaroo was created by 11-year-old Danielle, who was looking for a good way to track her money and allowance, and thought other kids could use such a tool. Bankaroo is available on iTunes, Google Play, and Amazon. This one is more of a game for kids. Join the fun in the magical town of Green$treets by rescuing endangered animals! Children earn money by planting a beautiful garden, or by tossing items in the treehouse using a catapult and keeping ShmootzTM, the gooey monster who is always making a mess, from ruining all the fun! Kids don’t even realize that they’re learning essential money and math skills. They learn how to set goals, budget, earn money, make decisions and give to charity. Find out more on their website here. Or go download the app on iTunes. 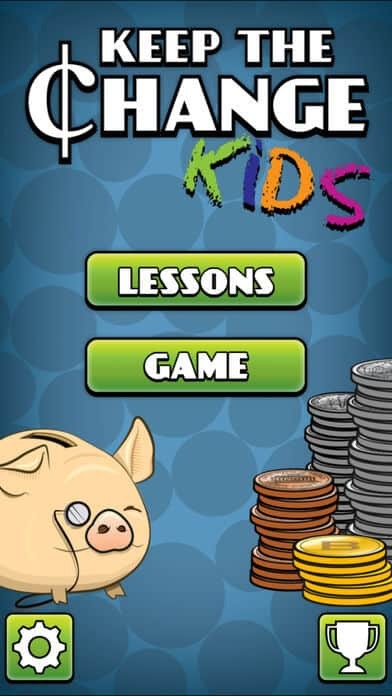 Keep the Change Kids is an educational puzzle game that teaches coin recognition and math. The app includes interactive lessons and a challenging puzzle game using coins. The objective is to match the change amount by connecting the coins. Touch and drag to connect and add-up the coins. This is a kid-friendly application, with no ads and no in-app purchasing. Keep the Change Kids is available on iTunes and Google Play, and Amazon. Savings Spree is a fun App with a serious lesson for children ages 7 and up (younger children can play too with a little help from mom and dad or an older sibling). The game teaches kids how the daily lifestyle choices that they make can add up to big savings or big expenses, depending on how they choose to spend (or not spend) their money. Savings Spree shows kids that they can SAVE their money for short-term goals (like a bike or an MP3 player), SPEND wisely by making more frugal decisions, DONATE to others or INVEST money so it will grow to meet future needs like a college education. Start your own cupcake store and learn about math and finances while indulging in your creativity. Buy ingredients, design cupcakes, and figure out how to sell them for a profit by balancing ingredient costs and cupcake prices. Practice math skills by using addition and fractions to solve word problems. Save the universe from financial ruin by traveling around the galaxy to defeat an alien super villain! Complete puzzles and answer quiz questions to earn money towards upgrading your space bike. With a rich story and fun but educational gameplay, this app teaches financial concepts such as saving, spending, investing, and inflation. I hope this list helped you. Make sure you go and download the money apps for kids that you like and start making chores, allowance and learning about money fun! Have a favorite money app for kids that you want to share? Comment below! When Should You Start Teaching Kids About Money? I was at a friend’s house last week and her daughter was so excited for her new toy. Her mom bought her a toy cash register at the store and she (3 years old) wanted to play store with everyone at the house. Without any direction, I watched her take the cash register out, round up the play coins, paper money and oh yeah the play credit and debit cards. The play cash register also came with play products like milk and cereal which she piled into the tiny play grocery cart it also came with. She had us bring our products up to the register and she rang them each in one by one and gave us a total to pay. Of course, her math was a bit off but hey she is only 3. Each transaction was different, sometimes she would swipe our credit cards and open the register to give us the paper cash back as change and sometimes she was having us pay in cash. 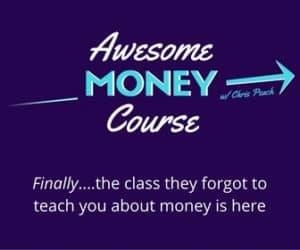 That moment prompted me to wonder, when should we start teaching our children about money and what are some of the best ways to go about it? At only 3 years old my friend’s daughter was already picking up on how transactions work. She was absorbing all the things she saw on trips to the store with mom. No one had to tell her a thing when she was playing with her cash register. She just opened up the register and started doing everything she knew about registers, shopping, and money. You may or may not be surprised to learn that we should start teaching our children about money when they’re just two years old! While your child may be older than that right now, the experts say that it’s important to get started teaching them about money as soon as possible. BUT it’s never too late to begin so no matter the age of your children, there are concepts we can still teach. So let’s take a look at the concepts that we can teach our children at every age. At this age, we can teach our children about the concept of money – in other words, what money is and what it does. We can talk to them about the value of different coins and bills. We can also teach them that money is used to buy things and also to save and give. Playing store is an easy way to begin teaching the concept of money to young children. You can see that in the story I shared with you above! An inexpensive register is a great affordable way to learn. They have a lot of different styles on Amazon. At this age, it’s a great time to start teaching children about the difference between a want and a need (because we know they sometimes “need” things at the store). 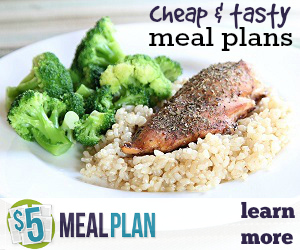 Children can help with the grocery shopping and begin to participate in decision making. This is also a great age to begin showing your children how to use a piggy bank and to introduce the concept of an allowance and working for money. By the end of elementary school, they should understand saving money to buy things that they want. I remember I had a piggy bank (which was a jar) growing up and I really think that helped me be the saver I am today. I saved every penny I received and put it in my piggy bank. At this age children are more than ready to begin earning money. You can tie allowance to extra chores or give them opportunities to earn money around the home. It’s also a good time to teach them about saving for their future and for things that they want to buy in the near future like a new pair of sneakers or sports gear. This is a great time to introduce a system like FamZoo to the family. If you haven’t heard of FamZoo you’ll definitely want to try them out. It’s basically a family “banking” system designed to teach kids to earn, save, spend, and donate money wisely in a safe, friendly environment. Parents are the “bankers”. Kids are the “customers”. By this time your child should have learned some financial independence. Hopefully, they’ve had the opportunity to work for money and they have learned about saving for both short-term and longer-term goals. Once your child is in college they will be well on their way to financial independence. Sure, you may be paying for college and helping them manage their finances. However, they should also be able to handle the majority of their financial decisions on their own. A great way to have your children be involved in college planning is by having them look at the cost of colleges with you and having them apply for scholarships as well. If the scholarship process scares or overwhelms you, you should check out The Scholarship System which is a course that teaches parents and their children how to apply for multiple scholarships and secure thousands for college. 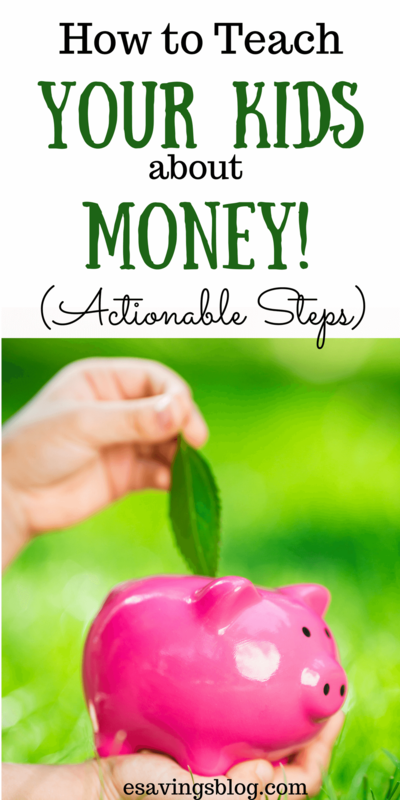 It’s a great way to involve children in the financial process. You can check that out here. It’s never too late to begin teaching our children about money, saving, giving and investing in their future. Let’s check out some teachable moments. Teaching our children about money takes more than one conversation. Using real-life situations and examples will help them pull the concepts together. They’ll learn not only from our words but also through our actions. Here are a few ideas and opportunities to talk to your child about money. When our children receive gifts for their birthday or another holiday, it’s a great time to talk to them about saving some of the money. We can even help them plan how they’re going to save and what to save for. To our kids, the ATM is a magic box that spits out money when you enter a secret code anytime we need it. Don’t we wish! But that’s what our children might think if we don’t talk to them about what the ATM is and how it works. It’s a great opportunity to talk about earning, saving, and making spending decisions. Chances are that your child goes with you when you go to Target or the grocery store. This is an ideal opportunity to explain to our children about budgeting. We can talk about how different items cost different amounts. We can even ask our children to help us compare prices and find the cheapest priced item on the shelf. This can make saving money fun for them. Many adults intentionally don’t talk about money in front of their children. However, in many cases, that’s a mistake. When children are aware of the family finances and understand about income and expenses, it helps them see the big picture. It’s also a good opportunity to talk to our children about different ways to save money and why they might want to save money. For example, we can talk about turning the lights off when they leave a room and using any energy savings to put toward something fun for the family like a vacation. Of course, we don’t want to create added stress for our children if there are financial difficulties. However, involving them in discussions about your budget helps them have a better understanding of money. If you give your child an allowance, it’s an opportunity to talk about their decisions and what they’re going to do with the money. 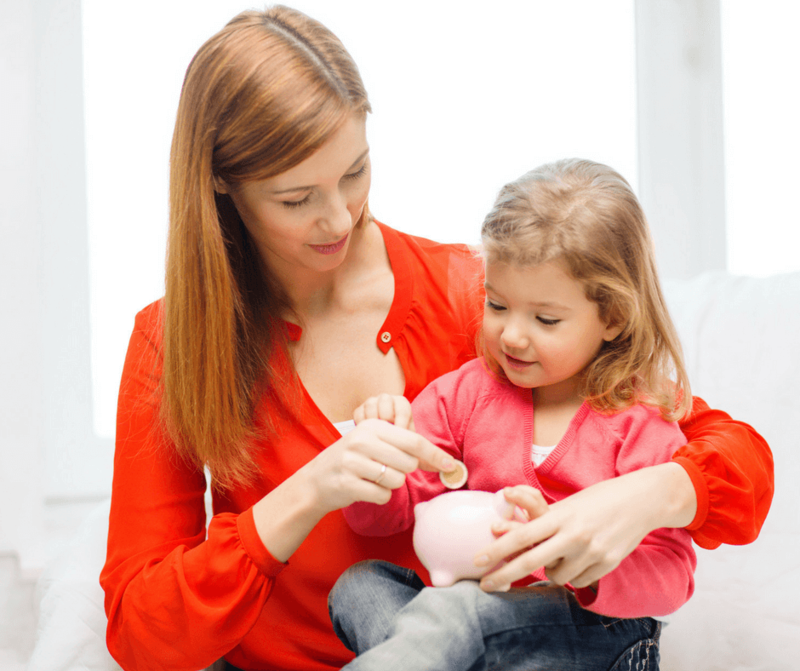 Depending on your child’s age you may have requirements for their allowance. For example, you may require them to donate some and save some as well. You also want them to work for their allowance and do things in addition to their regular chores. Their regular chores should be expected because when they become adults they will still have them and won’t be getting paid to do them. With busy lives, it’s easy to overlook opportunities to teach our child about money. However, they’re present almost every day. Take advantage of them from time to time and involve your children in your financial decisions and responsibilities to help them learn, both through words and actions, about money. 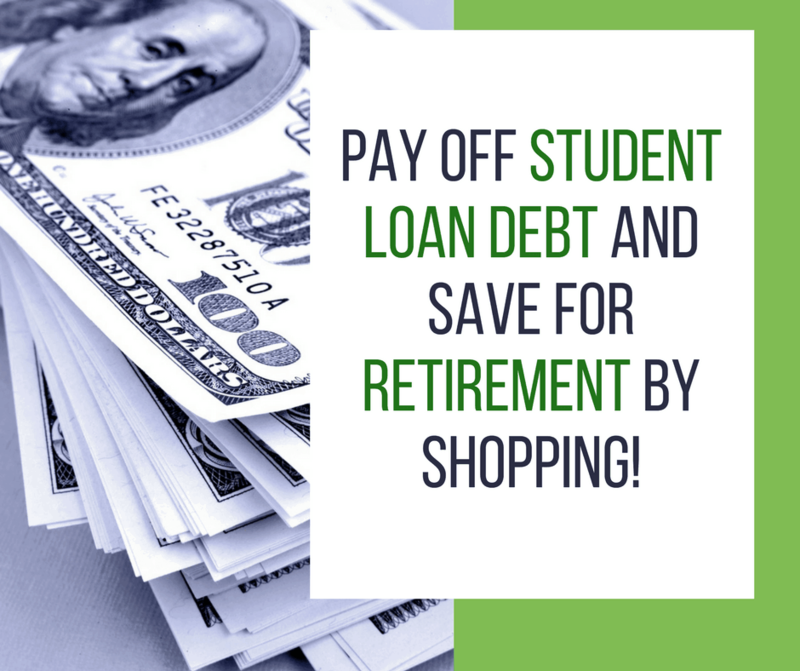 Pay off Student Loans or Save for Retirement by Shopping! This is NOT a sponsored post but I loved EvoShare so much I joined their affiliate program so I am using my affiliate link. See full disclosure here. I was listening to a podcast recently (I can’t remember which one or I would definitely give them a shout out ) and learned about a new website called EvoShare. The reason why EvoShare stuck out to me is that they took something I was already very familiar with (cashback web sites) and used it to help people financially! If you’re not familiar with cashback websites they are basically a type of reward website that pays its members a percentage of money earned when they purchase goods and services via its affiliate links. They are absolutely free and cost you nothing extra. 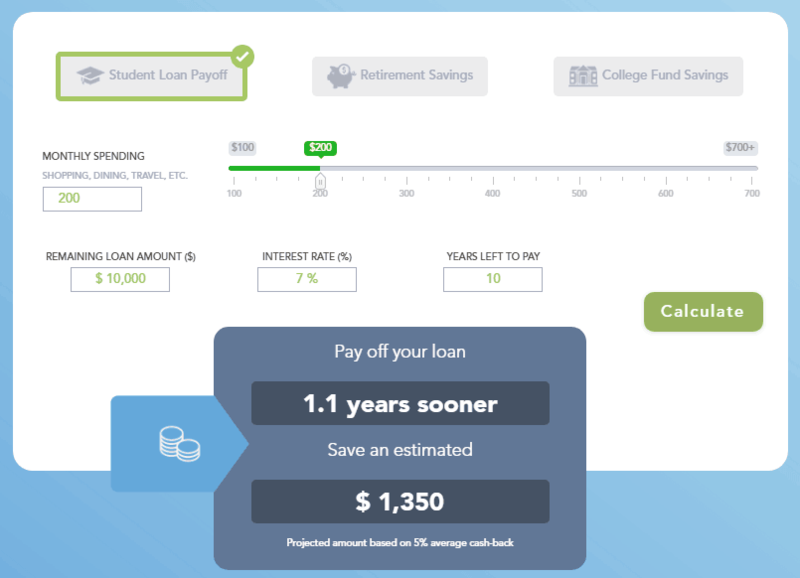 They have taken the cashback website concept and turned it into a way for you to either pay down your student loan debt OR save for retirement! Instead of just getting cashback that you end up spending, you get to transfer it into a retirement account, college fund or use it to pay down a student loan. EvoShare is open to everyone no matter what stage of life you’re in. You can start earning cashback now even if you haven’t accumulated any debt or opened a retirement account yet. EvoShare will just hold your earnings until you need them for a retirement account, student loan, or college fund. Unlike most cash-back programs that offer you earnings today that are gone and spent tomorrow, EvoShare’s model ensures your cash-back either compounds with time in your retirement account or saves you time and interest on your student loan debt. 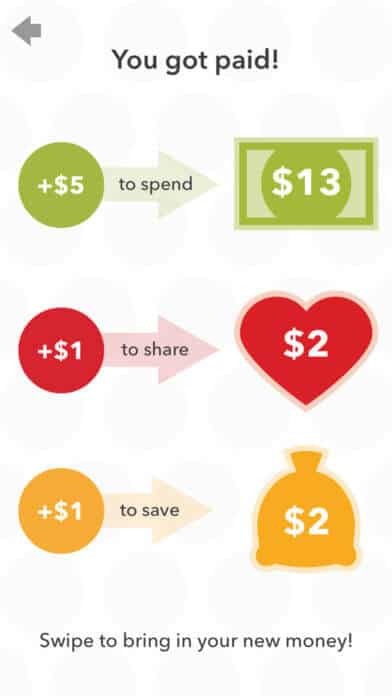 This is why EvoShare is a smart cash-back solution that delivers real financial benefits without making you spend more than you already do (love that)! Try their easy to use savings calculator to estimate your possible savings! The more you shop through them the more you earn. 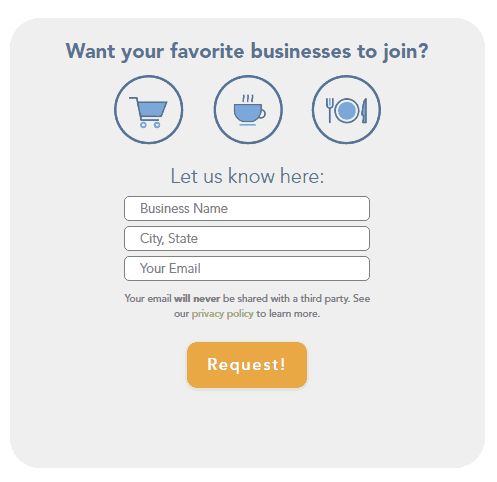 With over 4,500 online and local businesses in their network, it won’t be hard. Just type in your numbers into their calculator on the website and see the possibilities. You can see projections for student loan payoff, retirement savings, and college fund savings. Don’t see a business you shop at often in their network? You can suggest businesses you would like them to add and if they get enough requests they will reach out to that business and do their best to try and get them to join their network. There is a simple form right on their website to do this. EvoShare works online and offline! When shopping offline at partnered brick and mortar locations, you will just need to link your debit/credit cards to your profile. This allows EvoShare to ensure you receive cash-back for every qualified transaction and have it automatically deposited into your account. When shopping online, just be sure to go through your EvoShare Dashboard or use their Chrome and Safari extensions. That’s how EvoShare can identify your purchases at participating online businesses and ensure you receive the amount of cash-back you’ve earned. Cash-back earnings normally take 1-2 weeks to process. You will see your cash-back earnings reflected on your dashboard as points; 1 point equals $1. Remember you only need to link your payment card when making offline purchases at local participating businesses so it’s not required if you only want to use it for online shopping. Get Started with EvoShare and Watch Your Savings Grow! 1. First Sign up. It’s free! You can sign up here. 2. Connect your accounts if you have them now or wait until you do. 3. Download their Chrome/Safari extension so that you won’t forget to go through them! I find a lot of people will sign up then forget to use it! If you’re doing this you’re leaving free money on the table. 4. If you plan to shop offline then connect your credit/debit cards that you will be using for those purchases. 5. Watch your savings grow! Easy! How are you saving for retirement and paying down your student loan debt? Share with me in the comments!